Give the back of your ranger some added protection with this extreme rear bumper. Stop cracked floorboards with our aluminum panels. Simple installation in minutes. Great all around winch, comes with mount kit made specifically for the Ranger 800 and 570 non XP full size. Great all around winch, comes with mount kit made specifically for the Ranger 800 and 570 Full Size (non XP). This window is made of a thick marine grade vinyl which is bolstered with a heavy duty cloth and is attached with heavy duty snaps. They are plenty durable and won't yellow or fade. Window can be rolled up or removed in seconds for trailering or for increased airflow thru cab area. Window runs the entire width of the unit compared to other brands with large blind-spots. Get the best winch out there for your Polaris Ranger 800 body style with the Viper Wide Spool series made by MotoAlliance. Keep your Ranger warm with the Firestorm Compact Heater by MotoAlliance. Up to 14,600 BTU, custom fit just for your Full Size 800 or 570 Polaris Ranger! 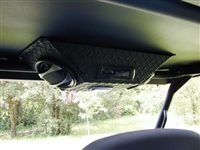 Need extra protection AND a winch mount? Try out this Extreme Metal Products front bumper for your 800. This is a smaller version of the rear rack made by Trail Armor and adds looks and functionality to your full size Ranger. 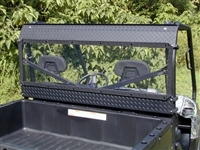 Expand the use of your Ranger bed with these cargo bed rails. The Ranger Full Size bedrail system includes a head rail, both side rails, 5 Twist Lock anchors and 2 corner brackets. 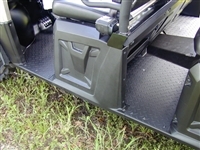 Need more bed space in your Polaris Ranger full size? This Ranger Cargo accessory rack spans the entire width of the bed increasing the bed space and allowing plenty of places to tie things down. Includes 2 Twist Lock anchors. This windshield by Kolpin made of rugged 1/4 inch scratch resistant Lexan Polycarbonate. Has 3 positions along with the top part being completely removable in seconds. This windshield is made of rugged 1/4 inch surface hardened polycarbonate. It won’t rattle or bow. The frame is constructed of sturdy aluminum diamond plate panel using all stainless steel hardware and self locking nuts. Trailerable up to 65 MPH when folded down. Store everything in sight and securely with this front rack. New design allows better view and clearance.